I have decided to join the blogging craze. 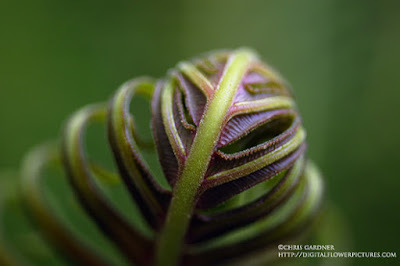 I am looking forward to taking a moment to find out a little more about the plants I have been photographing. 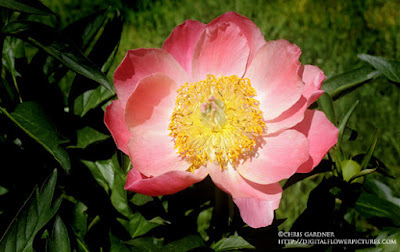 I hope to explore all aspects of plants, flowers, trees and other garden related topics. Sorry about having to watermark the photos but there are a lot of people using them without permission. An interesting short groundcover for moist sun and part shade. The flowers and fruits do not add up to much and this plant is primarily grown for it’s dark foliage. 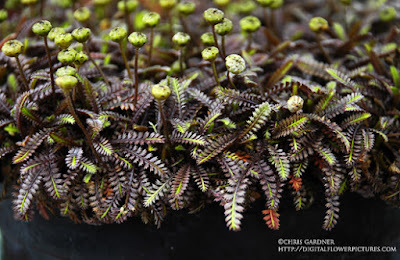 It is the perfect groundcover for a ‘black’ themed garden. It grows well in cracks of walks and can be used as a turf substitute, as it can take light foot traffic. Even though this plant lacks the traditional trunk of a tree fern it still has a stubby 12 inch stipe that can be seen if observed closely. Its new growth is anywhere from bright red to washed out pink and the fronds harden off to green. 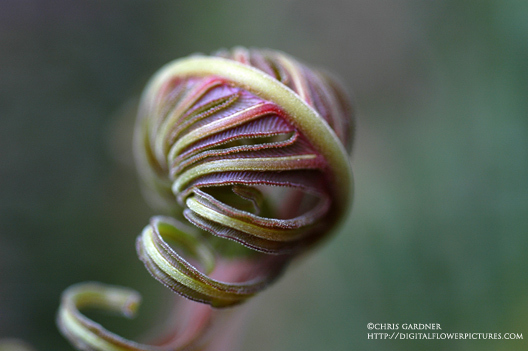 In botanical terms these photos are examples of Circinate vernation. That’s the name for the way a fern frond emerges. Staying tightly wrapped until hardening off a bit. This plant was growing outdoors during the summer but was brought in during the winter. This is always a favorite of mine. This plant has nice big, detailed and colorful flowers. 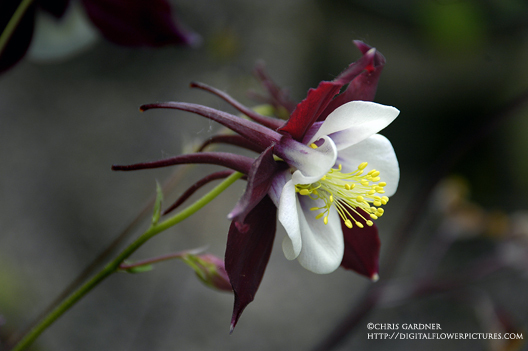 Columbines are a true biennial but if you try you can start a nice patch of them by spreading the seeds out when they are ripe. My experience is that some types come back true to seed and some don’t. There is also that gray genetic zone where for a few years they come back the same color and then wash out. I’m not sure what the Swan hybrid series will do. The plants did well this year and I wouldn’t mind having some of them back. This plant changed its scientific name a while back and I still use the old one. I am so not a trendsetter or rider. It is now classified as an Oenothera and I am not sure why. That is a genus, which sends a bit of a chill up my spine because of tendency to run a little rampant and be invasive. However, I have leaned to grow Sundrops and know how to manage them now (borderline iron fist). This plant is much more graceful and a better garden citizen then most Oenothera. This is a tough plant that is long blooming. It absolutely needs full sun to flower properly and good drainage. It is drought tolerant and can grow in dry areas but I have found it likes a bit of moisture too, especially during establishment. It can be short lived but worth having as a supporting character in the border. This photo doesn’t quite do justice to the color of this flower. It’s a Mr. Lyman Cousins’ “Innerglow” hybrid. 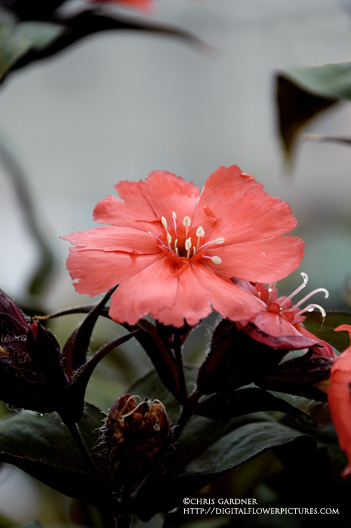 Known for their luminous qualities and fragrance. A true winner. This is a plant that clearly exceeded its ability to get named. There are many identities that this plant is masquerading under. Developed by Sunny Border Nurseries here in Connecticut this plant shows a lot of potential. The vermillion color is super and only partially represented here. The dark foliage tips add a beautiful background that is a nice compliment to the flowers. Generally I think of Lychnis as a cooperative plant that grows well in lean soil and dry conditions. It often reproduces from seed but not in a bothersome way. 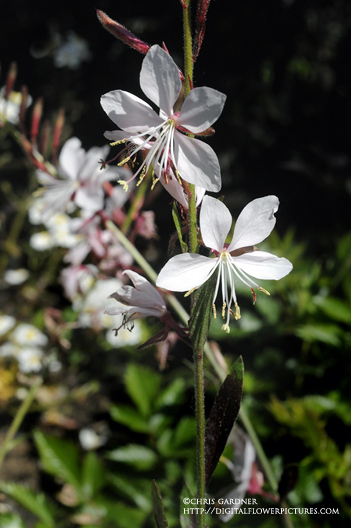 This plant can be used in the cottage garden, perennial border and in tough rocky areas. Here is another one from my non-flower photography tries. It is a conversion from a color shot because the D70s does not have a monochrome setting. 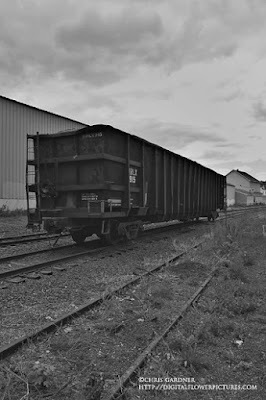 It is a box car on the Housatonic Railway. Professional gardener that loves plants and flowers.